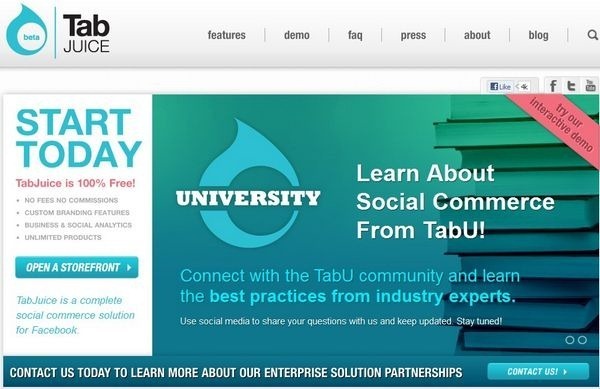 Social media has become standard practice for eCommerce merchants. An astounding 86% have Facebook pages, 37% have a Twitter account and 63% have a YouTube channel. With E-Commerce spending Spree set to increase to almost $327 Billion by 2016 every e-retail merchant is out there on social media trying to lure as many customers as possible. With over 900 million users, Facebook has surely caught the eyes of the major brands around the globe. Brands have started believing that there are more potential customers using Facebook than there are on their sites or any other e-commerce site. Usually Brands use Facebook to just keep the users informed of the various offers and to try and keep the interactions with the user up-to-date, there are many brands who have actually come up with a very innovative technique to try and lure users to start shopping on Facebook itself while having a chat with buddies or while playing their favorite games. Though users do not think of Facebook as a buying and shopping platform, many brands are increasingly getting lured with the idea of letting the users do so while just hanging out with friends. If a brand decides to go for having its products for sale on Facebook than there are many applications which help the brands to add a very effective Storefront with great options for product display and payment options. These applications help in creating a very pleasing shopping experience for the customers. In this post we are publishing 13 Apps to Set up an eCommerce Storefront on Facebook to help and inspire merchants to get their own shopping cart on Facebook. 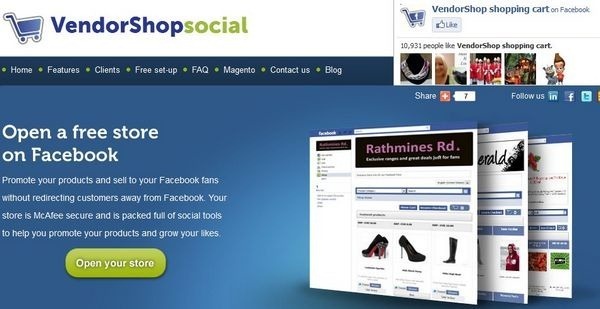 With VendorShop you could create a fully integrated, secure Facebook store. Add categories and attributes for products. You could also choose between a variety of shipping and tax options. Payment option includes PayPal and various other options. You could also create special offers and Competitions. The app lets you set up products, categories of products (i.e. shoes, T-shirts, sweaters), import photos, list terms of service and shipping options and more. Once you set up your online shop on Facebook, it will show up in a separate tab on your profile or page under “storefront”. The company also offers a virtual shopping mall of all of its storefronts on Facebook. 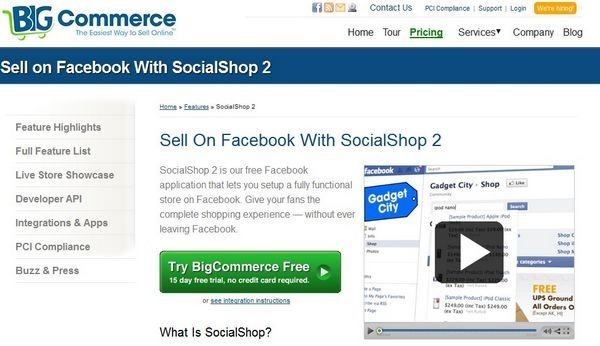 You can use same Ecwid storefront on numerous web sites, blogs and social networks simultaneously. And you can manage it all from a single control panel – changes are mirrored instantly across your sites. Ecwid seamlessly integrates with your existing web site with no programming needed. Ecwid supports drag-and-drop customization. 100,000+ sellers use Ecwid. 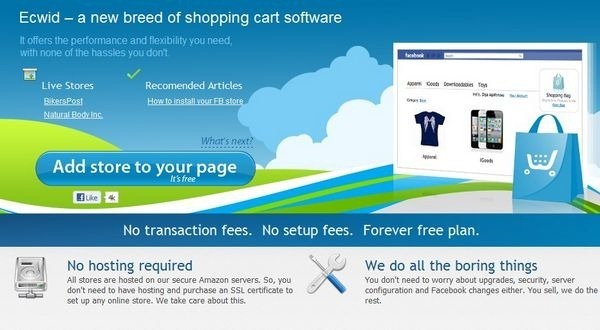 This free PHP shopping cart lets you create a cart to display on your Facebook profile or Facebook Business Page. 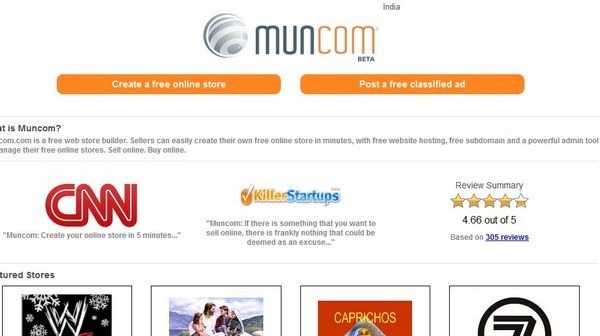 To create the cart you need to first design a free store on Muncom.com. Muncom’s shopping cart service is currently in beta. 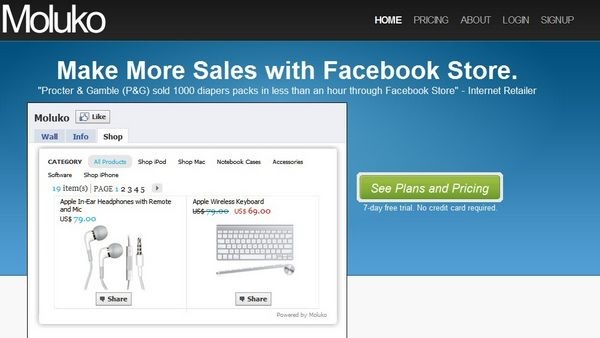 Convenient admin panel allows you to quickly place your items in your Facebook store. You’ll have the ability to display your merchandise on your Facebook page or profile. 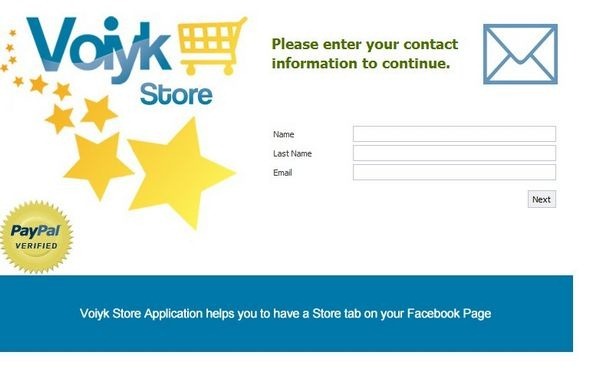 Easily setup your Facebook Voiyk Store and try the first month for free. t\The process of setting it up is pretty straight forward as well. ShopTab is an application which gives page owners the ability to add a shopping tab on their Facebook pages. It allows brands to showcase products from their existing online stores. A handy feature is the ability to export products from an E-commerce tool to the Facebook tool or it can be done individually as well. 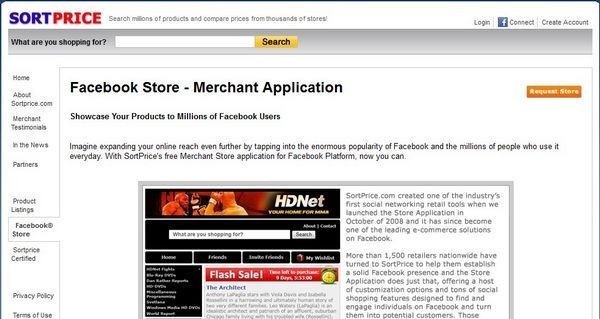 SortPrice has brought some big retail players and their product catalogs onto Facebook for people to search through, build Wishlists, and “Like” so that their friends can see what they are interested in buying. 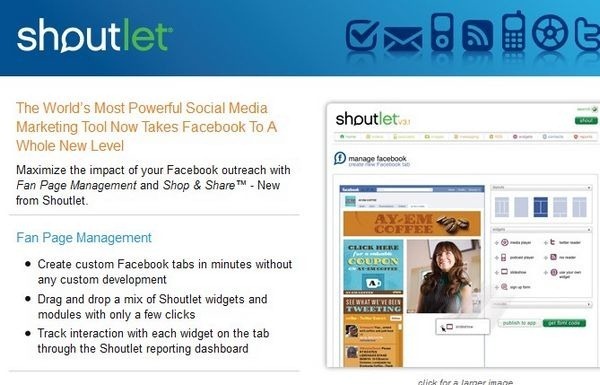 Shoutlet offers an enriched platform for E-commerce. 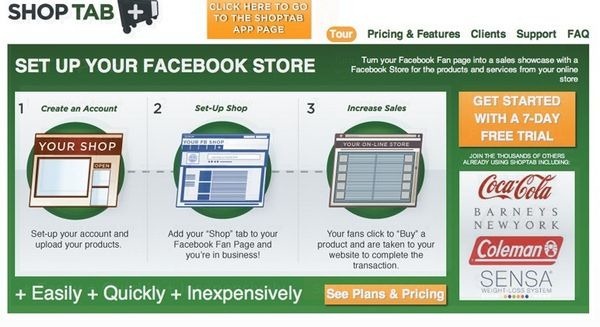 Merchants can turn their Facebook page into an online store and display their entire product line within a tab. A feature which stands Shoutlet apart from others is the ability to share a certain product with their friends on not only Facebook but 100 other social sharing websites. 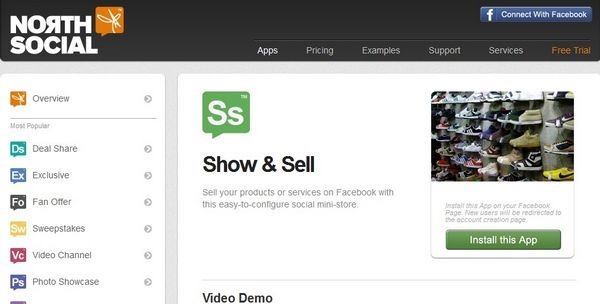 Perfect for adding a product showcase to your Facebook Page, our Show & Sell app allows you to display up to 10 featured items with unique “Buy Now” links and social commenting plug-ins. Viral functionality of the app ensures your products are spread wide, increasing sales, and social engagement with your brand. This App lets your customers share your store and their favorite products with their friends. It also has a Review platform option along with Real time tax calculations. It also has a All-In-Tab Shopping Experience. The demo gives a beautiful LiveFront Preview. 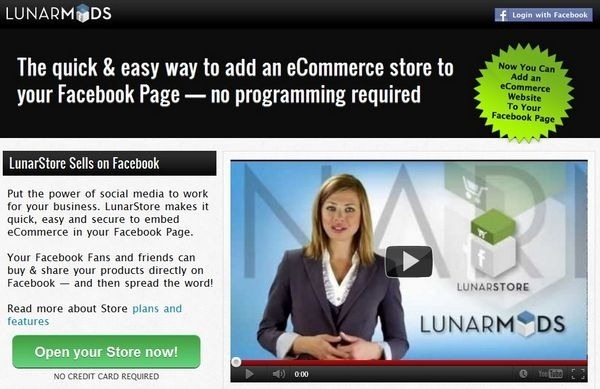 LunarMods provides fast & easy tools for customizing your Facebook Pages. 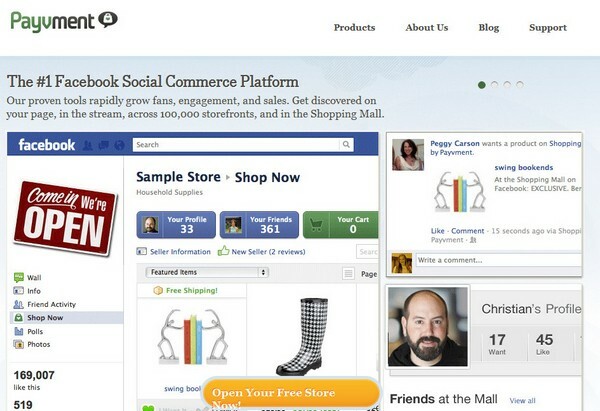 You can create a new store and install it on Facebook in about fifteen minutes. It provides SSL Encryption along with PayPal and Amazon Payment options. With Moluko you could build a standalone Facebook Store or link with your existing online store. Paypal Checkout system. Custom attributes for the products. Excellent tips. It is important to have the right tools. I recommend you Trisocial ( http://www.trisocial.com ) they have an extensive suite of apps to customize the fanpages and to do contests and promotions. regards!